Thanksgiving is approaching… and although I am not American, nor do I believe in the traditional tradition of the holiday, I do love the excuse to cook and eat like a proper thankful piglet. Last year I hosted my first Thanksgiving and I managed to make my first turkey, a home made cranberry sauce, stuffing, and a pecan pie, which although my guests apparently did not like pecans, really enjoyed. This year I will be hosting my second one and I’m already trying some recipes. I will definitely be making my Gingerbread Pumpkin Pie, some kind of stuffing, and a nice juicy turkey (I’m so much more excited about the leftovers). This is a great recipe for hosting a small dinner, or to make at home one night. You can literally substitute every ingredient, make it with rice, mushrooms, kale, whatever. I made this with what I had, so you can just use up everything on your fridge and make a delicious stuffing. 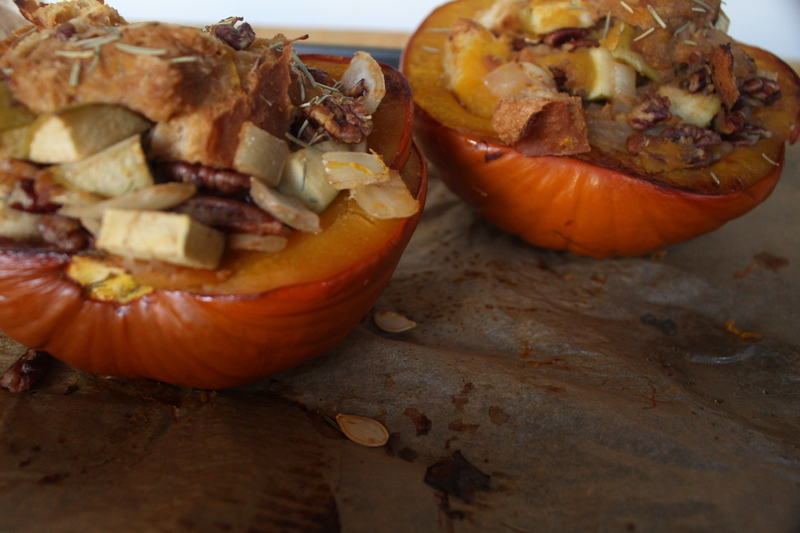 The pumpkin was pre-baked with a second one that was used for puree. Try it and tell me how it goes. Preheat the oven to 370ºF. 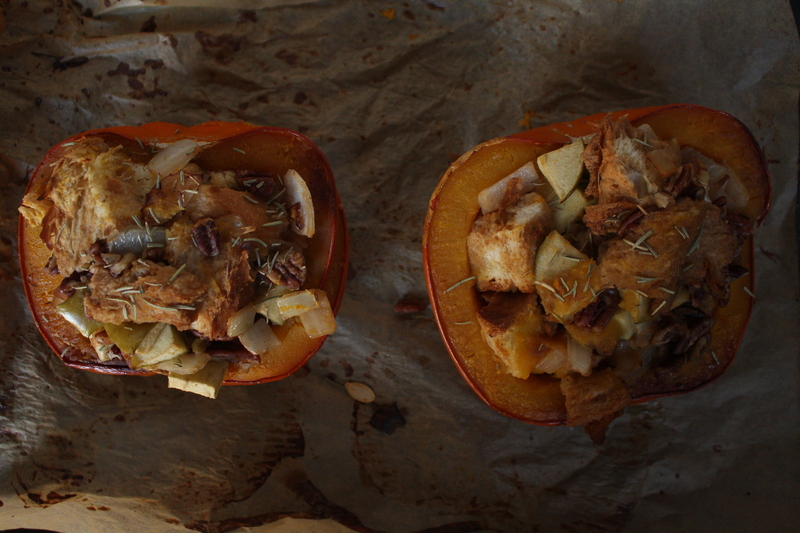 Cut your pumpkin in half, take the seeds off, brush with olive oil and salt, and bake for 35 minutes, until fork-tender. Chop the challah and place in a tray to lightly toast in the oven. Meanwhile, chop the onion and pecans, sauté in a hot skillet, add chopped apple, and season with some salt and pepper. 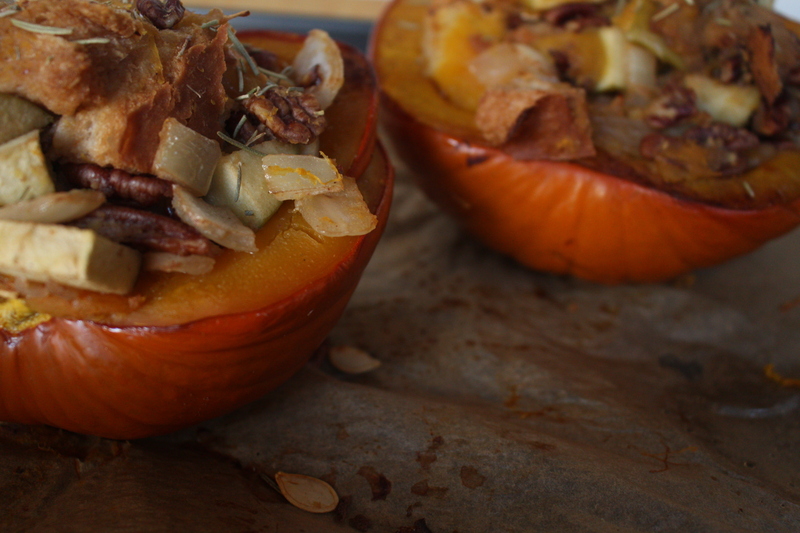 Mix the challah in, add the puree, add the broth, and fill the pumpkins with the mix. Sprinkle with rosemary and season to taste. you can add some cheese in there too! Como mexicanos sabemos que el concepto de Thanksgiving nos parece bastante atractivo: pavo gigante, pie de calabaza, ponche, relleno, y de paso, dar las gracias. Aunque difícilmente entendamos las razones originales de la fiesta, hoy en día es una gran excusa para ver a la familia/amigos, cocinar y comer mucho. Este será mi segundo año hosteando la cena de Thanksgiving en Chicago. El año pasado logré hacer mi primer pavo, un pie de nuez delicioso, salsa de cranberry, y relleno de champiñones. Esta receta no es necesariamente para una cena de TG, pero es un gran platillo para compartir. La receta es buena, pero realmente la puedes rellenar de lo que quieras y cambiar todos los ingredientes (champiñón, queso, arroz, etc).Puede ser vegetariano o con carne. Mi plan era hacer puré de calabaza para hacer mi pie de calabaza con crust de galletas de gengibre, pero me sobró una calabaza entera, por lo que aproveché para hacer este platillo salado. Es super fácil y tiene un look rústico y muy original. Precalentar el horno a 250ºC. 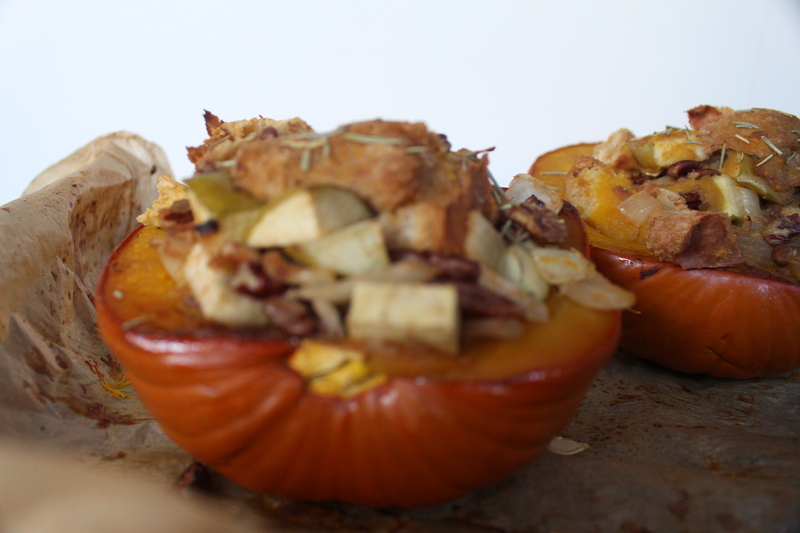 Partir la calabaza a la mitad, quitarle las semillas, barnizar con aceite de oliva, sal y pimienta y meter al horno, con la piel hacia arriba, por 35-40 minutos. Cortar en pedazos el pan y tostarlo en una charola en el horno unos minutos. Rebanar la cebolla y las nueces y saltear en un sartén caliente con un poco de aceite. Agregar la manzana, el pan, puré y finalmente el caldo. Revolver todo y rellenar la calabaza. Meter al horno por 20 minutos, y decorar con romero. Se puede gratinar con queso, agregando el queso los últimos 7 minutos. Y por si nunca han visto la gran película de Los Locos Adams, aquí un extracto que me hace muy feliz.